The latest annual Chick-fil-a calendar featuring the "Eat Mor Chikin'" cows is now available at your local Chick-fil-a. 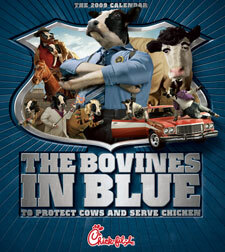 The 2009 version has a police theme called "Bovines in Blue." The 2009 calendar features monthly portrayals of notorious Bovines in Blue who have taken burger enforcement into their own hooves in an attempt to save their fellow cows’ hides. Highlights include Charsky & Hoof breaking up burger rings and foiling beef extortion plots; the ever-resourceful MooGyver who has guided countless villains toward the ways of chicken-eating; a Grill Street Blues officer questioning a burger-eating criminal; and BSI: Bovine Special Investigators reconstructing elaborate lunch scenes using fork trajectories, ketchup splatter patterns and the latest in sesame seed analysis. Now that cloning cattle is approved in the US, and cloned beef is on the shelves, it might be neat having one of the calendar's months devoted to identical, I mean identical cattle. You know, like a house of mirrors, then a burger or something. I don't know, just a funny thought.